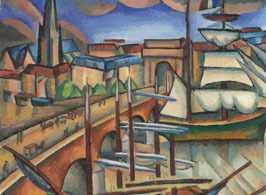 “Form and Colour – André Lhote and Swedish Cubism” at the Waldermarsudde Museum highlights the extent of Lhote’s influence in Scandinavia. André Lhote was a famous and important French artist and inspiration for the early Swedish modernists. This exhibition brings together 180 works by Lhote and Swedish modernists that were influenced by him, as well as works by Georges Braque and Robert Delaunay. Lhote's first solo exhibition outside France was in Stockholm in 1913 in the premises of the Swedish General Arts Association, and was funded by Prince Eugen. So it is fitting that this new exhibition is held at Prince Eugen’s museum, which now also owns and manages the largest collection in the country of Lhote's work. In connection with the exhibition, a comprehensive and richly illustrated catalogue of interesting articles will be published describing and analysing Lhote's significance for Swedish artists and Swedish modernism around 1910-1960. Anna Lena Lindberg, Anna Lena Lindberg, Viveka Bosson, Birgit Rausing, Stefan Hammenbeck, Marika Bogren, Anna Tellgren, Margareta Gynning and Louise Lyberg, all outstanding experts in their areas, as well as Waldemarsudde Karin Sidén, Anna Meister and Daniel Prytz are among the writers.